All Satcon solar photovoltaic inverters come with a standard 5-year unlimited hour usage warranty covering service parts and labor used in accordance with the Inverter Service Schedule. The Satcon Extended Warranty Plan is an extension of the Satcon 5-year unlimited hour usage warranty for a period of up to 20 years. 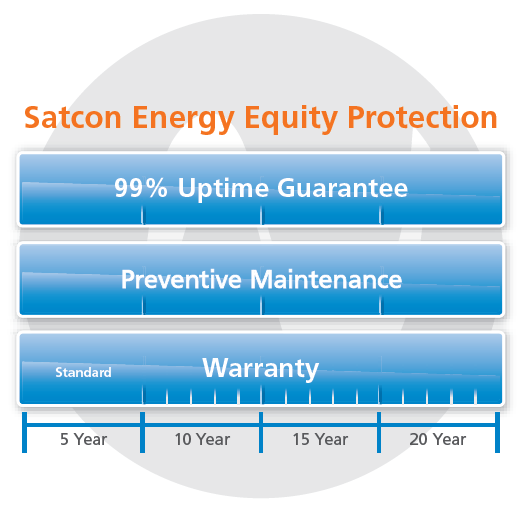 The Satcon Extended Warranty can be purchased in one or five-year blocks at any time at an additional cost within the Warranty period prior to the expiration of the current Warranty term. Terms and conditions will be the same as those applying to the Standard Inverter Warranty. Standard Warranty - Satcon offers a five-year unlimited hour usage standard warranty. Extended Warranty Plans are offered as an extension of the Satcon five-year unlimited hour usage Warranty for a period of up to 20 years (in one or five-year increments) to ensure worry free usage. All Extended Warranty Plan options cover the Inverter's mechanical and safety critical components for up to 20 years from original date of purchase. The Satcon Extended Warranty can be purchased at any time within the Warranty period before the current warranty ends. The Satcon Inverter Assurance Program is available to owners of Satcon inverters purchased prior to 2014 and is designed to ensure the highest levels of system uptime for your assets across every installation. The Inverter Assurance Program is available in three levels of coverage and can be added to your service plan at any time.